Big news, folks! I’ve been nominated for a Shorty Award in the category of Instagram Post of the year for my “We Got This” (AKA Lift Each Other Up) post! Wanna help me win? Cast your vote here! VOTE IN THE SHORTY AWARDS! The House That Lars Built: "Becoming" Series Interview! 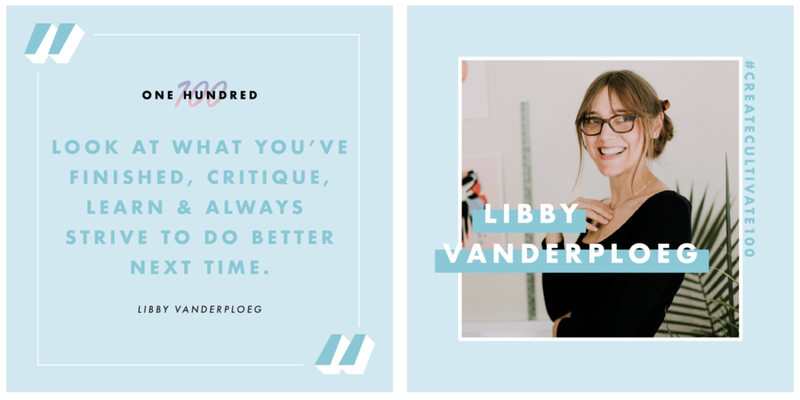 I’m so excited to be included on the Create & Cultivate 100 this year! It’s such an honor to be featured amongst this group of amazing women. I hope you’ll read my interview, and also check out profiles of the other 99 women on the list! And a huge thank you again to Molly Benningfield Singleterry for the opportunity to share my story, to Inkling Pictures for the amazing video, and to Leigh Ann Cobb for these wonderful photos! Hey NPR junkies! Angela Garbes, author of Like A Mother: A Feminist Journey through the Science and Culture of Pregnancy (published by Harper Wave), will be talking about her book today, Tuesday 5/22, on Fresh Air! Good choice, Terry Gross! I'm so happy to have had the opportunity to illustrate her book cover. The book is available for preorder, and officially out in the world on 5/29/18. Got a creative kid in your life? Looking for fun summer activities to stave off their summer boredom? Then sign 'em up for my Summer art workshop at Saugatuck Center for the Arts, July 19-20! Join me for two days of "Drawing Remixed," a drawing and collage workshop for 7-14 year-olds. It's gonna be fun! Happy to announce that I'm now being repped in the UK by the outstanding illustration agents at Snyder New York. I've been repped in North America by Snyder since 2015, and am looking forward to more fun projects with them abroad (and excuses to travel to London, always). Attention stripe fans! The Art of Stripes, the latest book in my Art of series with Hardie Grant UK, is out! As a total stripe junky (I have SO MANY STRIPES IN MY LIFE), this book is near and dear to me. Tops to bottoms, scarves to socks, this handy little lookbook is full of inspiration for how to wear all your favorite stripey pieces, plus profiles of some of the women who've made this pattern a style classic. It's available now on Amazon and in fine book shops. Tumblr x SaveArtSpace Billboard up in Austin! If you're in Austin this month, make a point to check out all of the amazing SaveArtSpace billboards that are up around the city! I'm honored to have my Vote Vote Vote artwork included as part of their #whatwillyoudo exhibition, in conjunction with Tumblr. You can find the Vote Vote Vote billboard on the North side at 3810 Medical Parkway. SaveArtSpace has partnered with Tumblr to bring Public Art to Austin, Tx. for SXSW. 2018 promises to be a historic year. The midterm election will be a referendum on countless issues central to the our communities: Racial justice, immigration, healthcare, education, LGBTQ+ equality, and more. It all comes during a once in a generation resurgence of activism and volunteerism. We want to inspire the community to write the history of 2018 as it happens. Thank you to both Tumblr and SaveArtSpace for supporting artists and finding creative ways to bring more public art into the world! Also Michigan Maps are here! I think I've made somewhere around 50 maps since I've been an illustrator, and ever since I starting making them I've wanted to create one of my home state of Michigan. Well, fiiiinalllllly I did! Keeping things very local, they are printed on French paper, out of Niles Michigan, by the amazing silkscreen artists at Grand Rapids-based End Hymns. These 5-color, limited edition prints are now available in my Print Shop! Print Alert! For that Special Constituent in Your Life. Hey friends! What a #@! *#* year. If you're looking to adopt a new mantra, then perhaps consider "VOTE." And it never hurts to have an aesthetically-pleasing reminder up on the wall to get you into your polling place. Just in time for the holidays/ special elections/ midterms/ smashing the patriarchy, I'm now selling my "Vote Vote Vote" print! This giclée print is printed with archival, pigment-based inks on heavy-weight, hot-pressed, archival paper in natural white, and available in a variety of sizes. A portion of sales will go to Emily's List, working to get more pro-choice, Democratic women elected to office. Holiday shoppers! If you're looking for something fun to do in Brooklyn this weekend, stop by the Our Damn Selves Market on Sunday, November 19 at 150 Greenpoint Ave, hosted by my favorite Greenpoint vintage girl, Dusty Rose Vintage! Not only will it be full of amazing artist-made goods, but it's a benefit for Planned Parenthood. Win win. This beautiful flyer is made by Stone and Vein. Completely sickened, but sadly not surprised, to hear of another mass shooting in the U.S. today. I am thinking about the scientific method right now, and wondering-- if thoughts, prayers, and complete legislative inaction seem to be yielding nothing but greater and greater tragedy, then why not f*ing try to enact stricter gun laws? What will it take to get our governmental bodies to open their lock-tight minds to listen to the majority of Americans instead of the NRA? If you're in the mood to tell your reps how you feel about their inaction regarding gun control legislation, then feel free to download a pdf of this postcard and print from your home printer. It's often said that our reps DO listen to their constituents, although that's starting to sound like some whimsical folklore, given their inaction on the topic to date. Looking forward to midterms in Michigan! If you're as into analog maps and calendars as I am, then I have some exciting news. I've created a 2018 calendar of maps with Antrhropologie, now available on their site! Whether you're looking for some travel inspo or just trying to remember your parent's anniversary, this sweet piece of print ephemera has got you covered. You can purchase a copy here through Anthro's website! I hope you are having a nice start to Autumn! Even though it's 90 degrees in Michigan, I'm still feeling the magic of my favorite season. Time for cider donuts, leaf piles, and scratchy wool. So. Much. Wool. Happy Women's Equality Day to all my fellow ladies! When we support equal opportunity for women from the day they're born on into their golden years, we foster healthier, more peaceful, and more sustainable societies. Less than 100 years ago, a group of strong-willed, persistent (see: nasty) women succeeded in getting the 19th amendment certified, gaining women in the U.S. the right to vote. Obviously no small feat. In 1971, NY Congresswoman "Battling Bella" Abzug prompted congress to designate August 26 as Women's Equality Day, to commemorate the efforts of the suffragettes and the 1920 certification of the amendment. Feeling thankful for the advocacy of these women who were confident enough to speak up for their rights and strategic enough to secure their equality with legislation. Respect.